Though it is now more than a decade into the period commonly referred to as the ‘pink tide’ in Latin America, this era appears to be in its twilight. Many of the early governments and their associated leaders that were representative of this period are no longer in power. Questions are now beginning to be raised as to what can be learned from the past ten or so years moving forward and what will come next, particularly for social movements. The elections of more left-leaning governments that characterized the pink tide, were largely the result of the rise and flourishing of serious challenges to the Washington Consensus that so heavily dominated the region in the 1990s. Most importantly, it seemed that from that point forward, these states were no longer bound to the economic constraints of neoliberal policies and that large spaces had been opened up for alternatives. One of the starkest examples of this rejection of the preceding era and spread of alternatives was in the case of Argentina in 2001. Leading up to and after the financial crisis of that same year, the country witnessed the growth of one of the largest barter networks ever seen, the regular practicing of neighborhood assemblies, factory recuperations, and the overall spread of horizontal practices that strongly questioned the role of the state. These elements were also found in the Bolivarian revolution of Hugo Chavez which was one of the first countries to make the leftward turn. Hundreds of Communal Councils sprung up throughout Venezuela in an effort to bring the populace closer to the democratic process. For many, the new governments, some being lead by former guerrillas, were seen as allies in the struggle for fundamental change. In many ways this was true. The progressive change these governments began to initiate opened up new possibilities previously unseen in the region. Many people were lifted out of poverty and empowered through various programs such as Mission Robinson and Mission Mercal, achieving unprecedented levels of literacy and access to food respectively in the case of Venezuela. Similar achievements were also seen with the expansion of the social support program known as Bolsa Familia in Brazil under Lula. Yet, despite these improvements, many problems persisted. Unfortunately, while these new-Left governments have moved away from the US sphere of influence and challenged neoliberalism over the past decade, many things have remained the same. The institutions, markets and policies in this region which for so long had been the sources of socioeconomic degradation for many marginalized communities were merely superficially altered if at all. For instance, in the height of the neoliberal era large scale mining and extractive industries grabbed a foothold in the region; despite these new elections, extractivist endeavors have either continued or dramatically expanded in many places, often conflicting with the interests of rural and indigenous communities while having additionally negative impacts on the environment. Extractivist operations have often been given a greenlight in places like Ecuador and Bolivia, many times bypassing regional agreements with indigenous groups and more or less continuing the practices of the earlier neoliberal era. Similar problems have also arisen in the area of land. One way many governments in the region undermine collective sovereignty from below is in the the issuing of land titles. Because states require an extraction of capital from the governed, it favors individualism and incorporation. While the acquisition of land titles for some is an immediate goal, it ultimately serves a tool for squatting communities to be incorporated into a broader capitalistic project in the urban setting. This begins to erode the communal aspect of buen vivir and the construction of horizontal alternatives which inherently contradict the fundamental elements of the state. Furthermore, the region has witnessed a continued spread of monocultures and agri-business that have had similar effects. With the continuation of old practices behind a progressive face, many social movements have weakened as their energy was directed towards the state and many movements found themselves at a sort of impasse in terms of figuring out how to interact with these new governments while maintaining some sort of autonomy. As a result, divisions were created within movements in terms of whether or not to work with the state and exactly how to do so best. In other cases, many of the movements were co-opted by the state and at times violently repressed. This is not to say that the intentions of all of these governments are bad. However, it is demonstrative of the contradictions and limits of what can be achieved through the state and the effects they have on social movements, particularly those from below. Working with and making demands upon the state often reproduce the very hierarchical relations that movements intend to contest and subvert. Despite this, the same energy and sentiment that led to the pink tide has not disappeared. In fact, while some of the movements are no longer gaining attention, communities in struggle continue to organize in spite of the contradictions and difficulties of the ‘pink tide’ period. 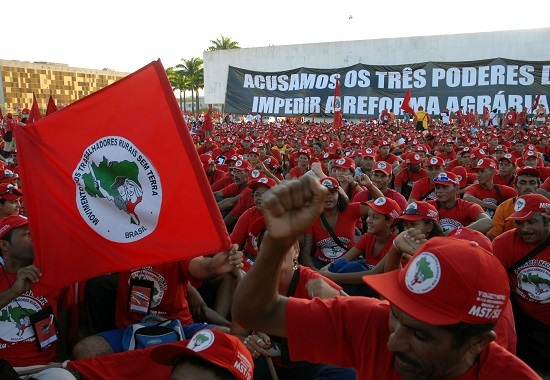 For example, the Landless Movement (MST) in Brazil may have weakened to some extent but the Homeless Movement (MTST) has re-emerged and communities throughout Brazilian cities have continued organizing around police violence and evictions in preparation for the World Cup and Olympics. In Argentina increased mobilizations and successes in the cases of mine construction have continued and many of the factories that were recuperated in the aftermath of the 2001 financial crisis continue to be run by and for workers. In Peru indigenous communities continue to resist mining and extractivist projects throughout the Andes. For instance, President Humala’s recent attempt at expanding the neoliberal policies of Lima were trumped by the unprecedented mobilization of tens of thousands of juveniles in the capital city in December of 2014. And just last year, the Bolivian government, under the guise of state development had proposed building a 360 mile road through the Isiboro-Sécure Indigenous Territory and National Park (TIPNIS) ecological reserve in the interest of clientelist relations with transnational corporations across the region. It was only when pressure and organizing from indigenous social movements the construction of the TIPNIS road was halted. 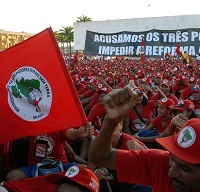 The cases seen here have dismantled the myth coming out of the elections of a unique partnership between social movements and the state. Despite its challenges, movements have continued to organize and push against governments. With this in mind, it is important to note that the pink tide seems to be ending and entering a new stage. Social movements are now confronting the challenge of entering and navigating through a more contradictory and complex terrain, that at times can be even more difficult. The difficulties and contradictions of the Pink Tide era have demonstrated the very problems of looking towards the state for change. Current movements must maneuver a delicate path in their critiques and dissent. Opposition that becomes too strong and vocal is susceptible to reactionary cooptation and pretext for external interventions; While weak or sporadic and tacit opposition will be brushed off as counter-revolutionary by the government as was recently seen in Ecuador. Yet, it is imperative for these forces from below and to the left to continuously challenge not only these governments but the state itself. The past decade and the current conjuncture are an opportunity to reinforce the importance of continuing what the Zapatistas have described as ‘caminar preguntando,’ walking asking questions. In other words, the pink tide has served as a learning process for many movements in the region as they continuously explore new approaches to the development of more just societies and moving forward they will have to continuously question and criticize how to proceed. For some time now emerging movements across the globe have kept their eyes on the cases in Latin America. The relationships between forces from below and pressure from above are constantly evolving, experimenting in new forms of governance, democracy and sustainability. After more than a decade of this process, the region now seems to be at a crossroads and many are beginning to question what exactly is the state’s role in a region as complex and diverse as Latin America. This is has been a long running debate among the radical left for quite some time. The Zapatistas and the writings of John Holloway had shed light early on in this generation of the left by creating strong examples and arguments respectively, for building alternatives to traditional forms of power. The endurance of organizing by Zapatistas is a testament to this and current movements in Mexico highlight the other ways in which the role of the state is being questioned. The call for the return of the 43 students is not limited to accountability for these students but many sectors of this movement are holding the state as complicit in this tragedy as they see it intrinsically bound to exploitation, corruption, and subjugation. Much of the dissent and protest coming from these sectors are rooted in the belief that the state itself, at least in the way it is structured and thought of today, is unable to uphold the values, ideas and cosmovisions of various social groups. As the vitality of these left governments seems to be waning, they have consequently exhausted their broad appeal as viable allies or tools of the grassroots. States, especially those of the Global South, regardless of their governments, are grounded in the historical legacy of colonialism while being inexorably part of the capitalist development of the North in their subjugation. The left governments in Latin America inevitably reach their limits in attempting a profound societal transformation through the very same institutions that were built alongside and with hierarchical structures of exploitation. For this reason, progressive reforms, such as the institutionalization of social movements, in a way re-consolidates power into the state apparatus clearing space for the reproduction of exploitation in other forms. Irregardless of their political identification or reform policies, the state is bound to the dictates of global capital and therefore susceptible to serving special interests ahead of the populace; applying only limited incremental changes accordingly. In some countries, the gap between the government and forces from below is diminishing as Latin American social relations move at an incredible pace in what seems like one social experiment after another, a testament to the diversity and strength of these movements. No one predicted the Pink Tide to extend as far as it did and much less so to be quickly followed by internal challenges. We are already witnessing some alternatives and the signs of a new transformative epoch on the horizon. Social movements continue to confront oppression and injustice both with the state and outside of it. Traditionally impatient, these forces are seeing the limitations of the state and are leading the way for new alternatives throughout the region and beyond. At the same time, in places like Argentina, Brazil and Chile we are beginning to see the resurrection of old conservative sectors that can not only halt the progress of the social movements but even reverse some of the reforms of the Pink Tide. It is impossible to predict what exactly the next phase of social transformation will look like in the region. Just as the movements that started the Pink Tide took center stage after decades on the margins, it is impossible to say where one may see the same energy re-emerge. However, it is safe to say that the strenuous relationship with the state will provide the lessons from which to build on. The revival of new concepts and identities out of historical traditions and collective memory are also becoming highly influential in these formations. 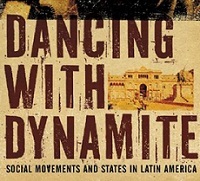 Bolivian historian and social theorist, Silvia Rivera Cusicanqui, highlights the complementary contradictions between the indigenous and Western worlds and how they can be utilized in the development of new subjectivities beyond the state. Reclaiming these values, from Bolivia to Ecuador and Mexico, has led to a reimagining of societies outside the accepted paradigms of contemporary society. While progressive candidates in the Global North in places such as Spain, Greece, Ireland and even the United States are taking hold of the radical imagination of many, the movements in Latin America, rather than looking towards the state, are looking across, horizontally, at how a new society can be built from the ground. Movements from below are continuing to envision and create alternatives to the structural systems of exploitation, dispersing power in the process. It is this form of decentralization that the concerns of the grassroots can be properly addressed; by looking across, horizontally, at how a new society can be built from below. Matt Binetti is a recent CUNY graduate, activist and interested in social movements in Latin America.